Creative photography ideas in the simplest of things? Nope, not kidding! There's a classic line used to refer to people that seem to laugh at anything, "he'd laugh at a brick wall!" 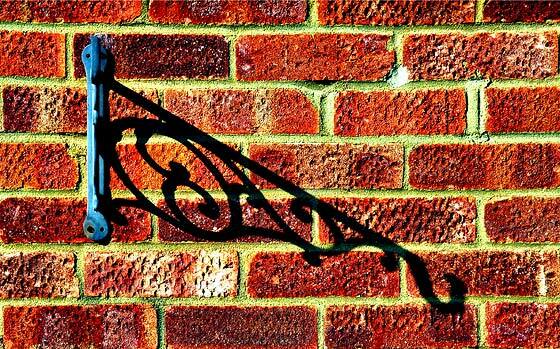 Well, with my special 'creative photography ideas' hat on, I thought I'd set myself a challenge - can I photograph a simple brick wall, and make it look interesting? So I set out today, camera in hand, children playing nicely in the garden, and started to look at our house a little more creatively. And here's one trick to generate lots and lots of creative photography ideas - look at the normal, in an abnormal way. So, brick wall - pretty normal, right? But when was the last time that you stood right next to the wall, shoulder touching it, and then looked up? Well, that's what I did with the first photo here. The addition of the hanger adds something, but even with out there's an interesting look up the wall with some sky in the background. In terms of a creative photography idea, this was a good starting point. 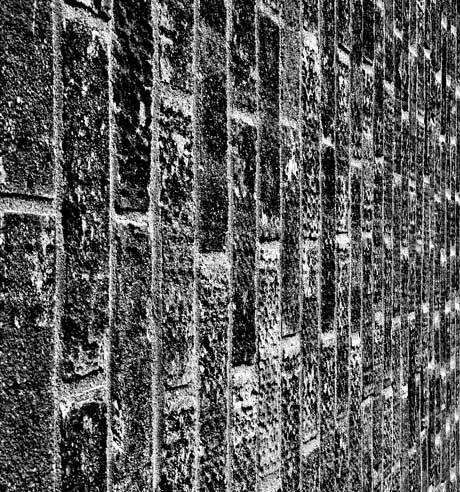 All I did later on was convert the photo to black and white using the channel mixer, and hey presto - a wall, but a bit more interesting. Creative Photography Ideas - take two! So, back to the wall and the hanger. Once I'd taken a look up to see what might be interesting, I took a step back, and looked at the wall head-on. This is another thing that we humans rarely do - sit and stare at walls - and probably for good reason! However, if it's creative photography you're after, sitting and looking, for longer than normal, definitely gets you looking at the mundane and ordinary in a whole new light. So I stared at the wall, and thought about the shadow, and then framed the shot so that the hanger and shadow loosely fit the rule of thirds. A quick click and I had my shot. But there was a little more that was required. A boost of the image saturation, beyond what was really there when I took the photo really seemed to give the final picture a little something extra. The photo is below, so judge for yourself. Creative Photography Ideas - they always come in threes! And finally, the third way of looking at that brick wall. This time it's back to an angle, but in this case, once I'd taken the photo I rotated it using software. It doesn't add amazing impact in this particular shot (it is just a wall!) but the idea is that by rotating an image away from the usual way of looking at it, an element of creativity gets injected. With this last photo idea I took the photo close to the wall, looking down the line of the wall to get some perspective. Once I'd taken the photo I again converted it into black and white as I felt that would bring out the grittiness of the wall. I could have saturated the colours (like in the second example), but just for a change I went for black and white. So there you go, three creative photography ideas using nothing more than a brick wall for inspiration. And if I can do it, so can you! Look at everyday objects from a completely different angle. 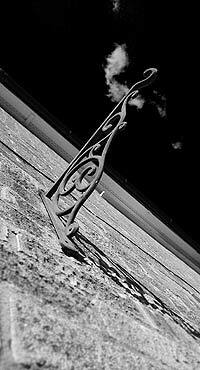 Take time to look long and hard at an everyday object - it might just start to get interesting! Rotate an image away from its normal viewing angle and see the difference. Trick photography - amazing images are just a click away!